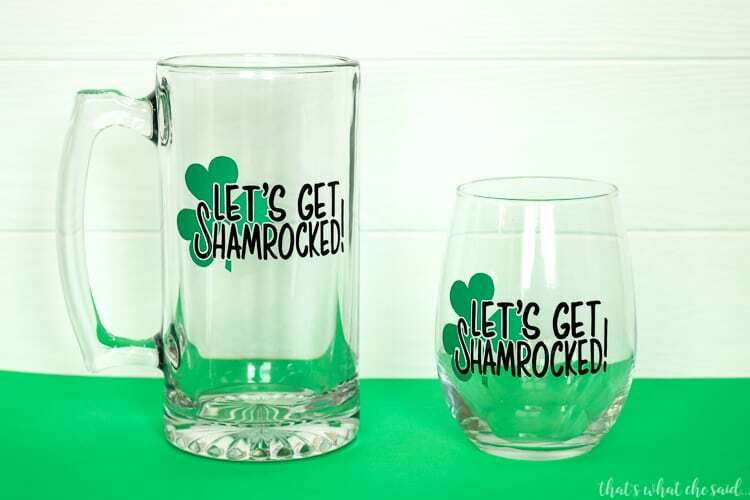 If you are a fan of Beer Mug or Wine Glass Decals then this St. Patrick’s Day themed “Let’s Get Shamrocked” design is for you! 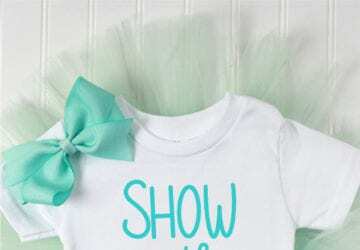 These are great for parties or gifts! Green Beer (or wine) will never taste as good as when out of these glasses! You could also use this SVG for a fun T-shirt idea! I am a fan of fun drinkware. I also find they are great gifts as other’s are fans of fun drinkware as well! You might have already read about my Hakuna Moscato wine glass decal or my Grinch Coffee Mugs or Grinch Wine Glasses. If you are new to how this works you might want to check out my Cricut Page or my Silhouette Page! You can also check out Vinyl Basics and my detailed instructions on how to apply vinyl perfectly here. 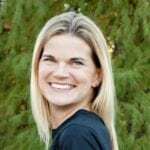 Today I am using my Cricut Explore Air. Prepare your drinkware as detailed here to get the best vinyl adhesion. 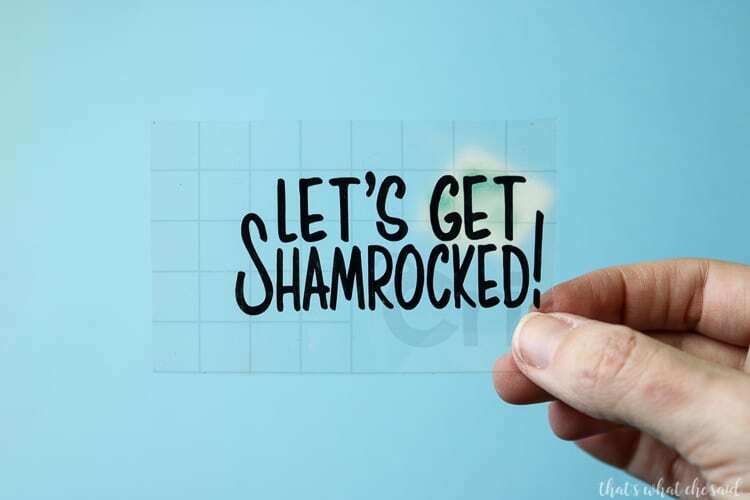 Download the Let’s Get Shamrocked Cut file below and upload it into Cricut Design Space. 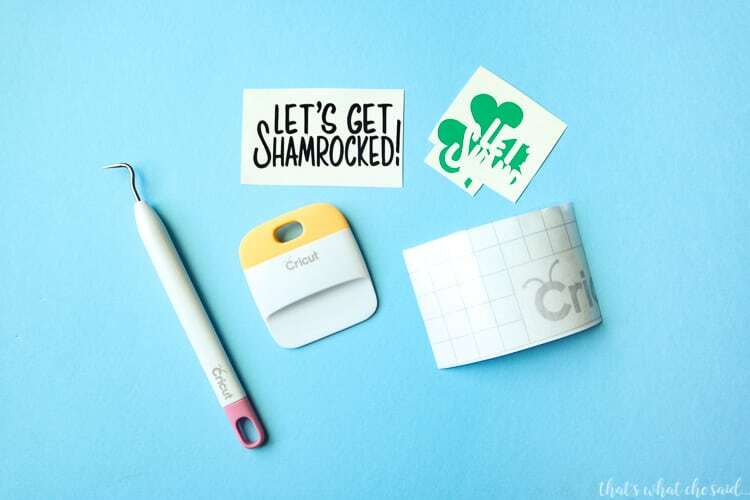 You can find detailed directions to upload SVG files into Cricut Design Space here. Size the design appropriately for your blank (shirt, mug, glass, tote, hat, etc). Cut the design. 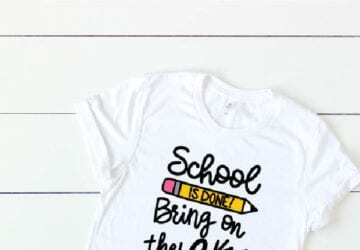 Click here for tutorial + screencast on How to Cut Vinyl using a Cricut. Once you have your pieces cut and weeded you can apply the vinyl! Since this is a design with 2 colors of vinyl and we need each color to line up with the other, I am going to cut a piece of transfer tape slightly larger than my entire design and I am going to apply it to the lettering first. Smooth the transfer tape over your black vinyl using the scraper. Remove the paper backing from the vinyl carefully, leaving your vinyl stuck to the transfer tape. Now you can carefully line the black letters up with the spaces in the green shamrock. NOTE: There is a bit of static cling that can happen. 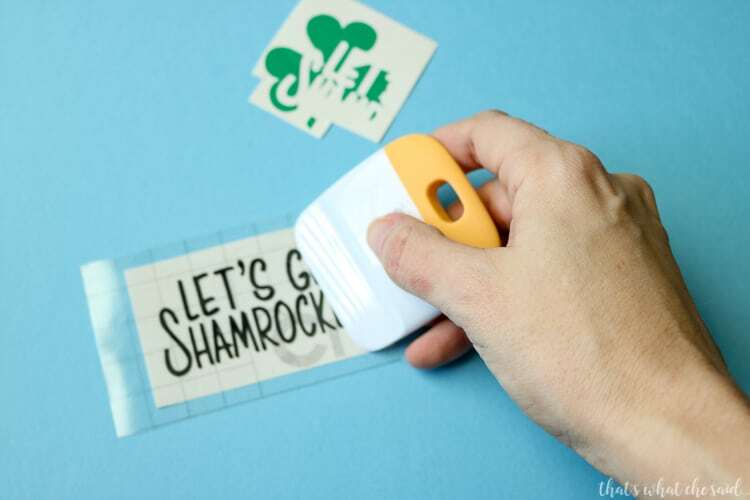 When you get your transfer tape close to the shamrock it might automatically fly up and stick to the transfer tape. 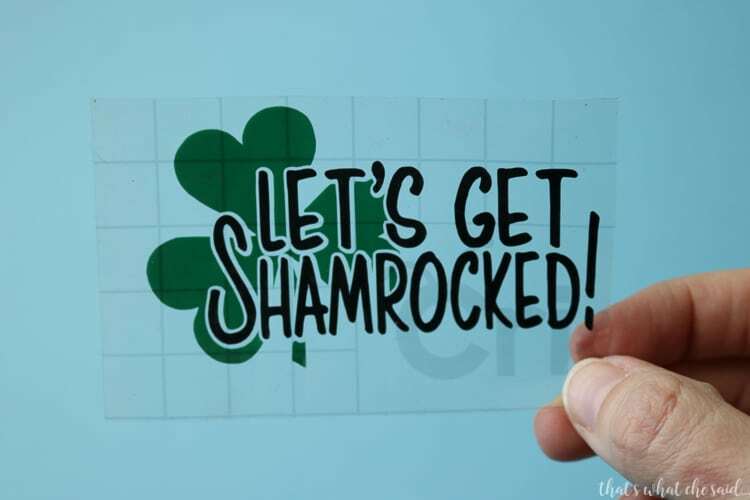 To negate this, tape your shamrock down to your surface first and then line up the letters. 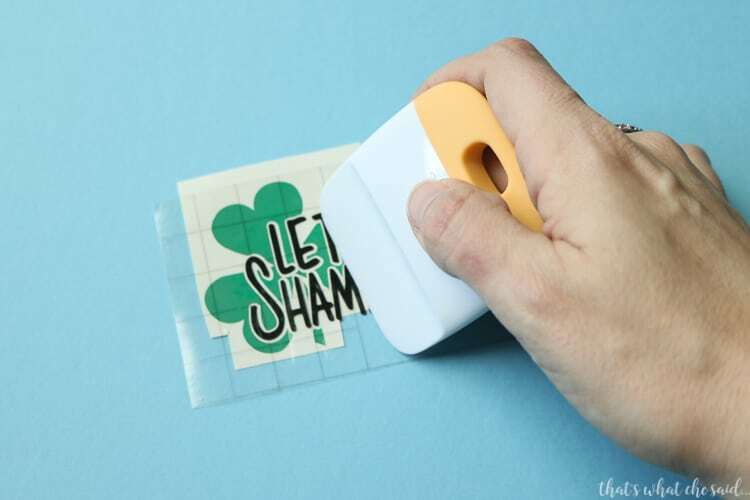 Use the scraper tool again to smooth the transfer paper onto the shamrock shape. 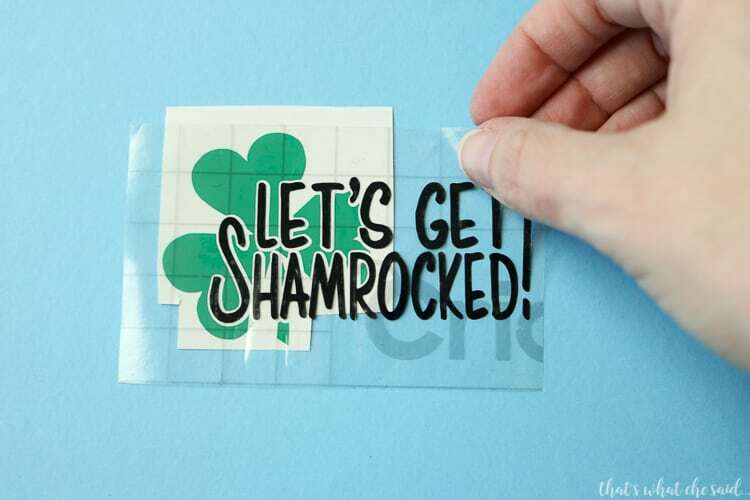 Again, remove the paper backing of the shamrock, so you are left with your complete design on the transfer tape. Now you will apply this to your mug or glass. Smooth the transfer tape and vinyl over the surface and apply some pressure with your fingers. Carefully remove the transfer tape leaving the design intact on your mug. 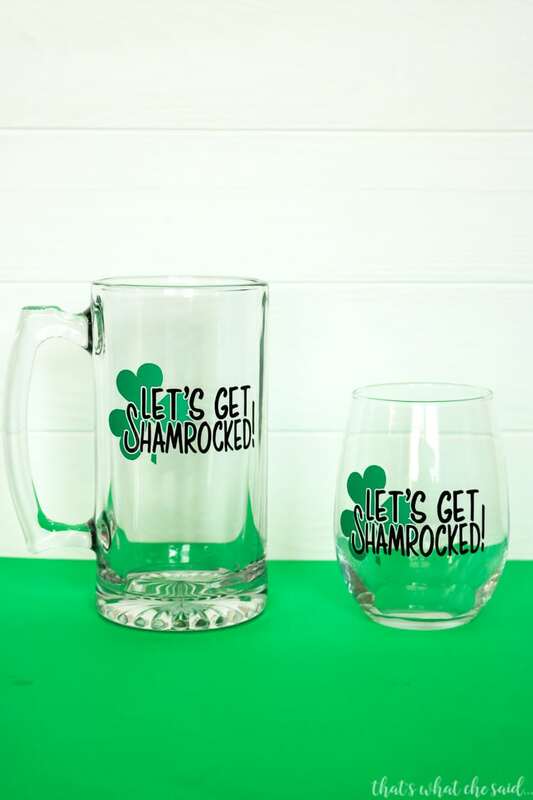 Now enjoy your St. Patrick’s Day Beverages from your fun new St. Patrick’s Day Let’s Get Shamrocked Mug or wine glass! You can even cut this file in heat transfer and use it on a shirt! These would be fun to make if you are going to a parade with some girlfriends! 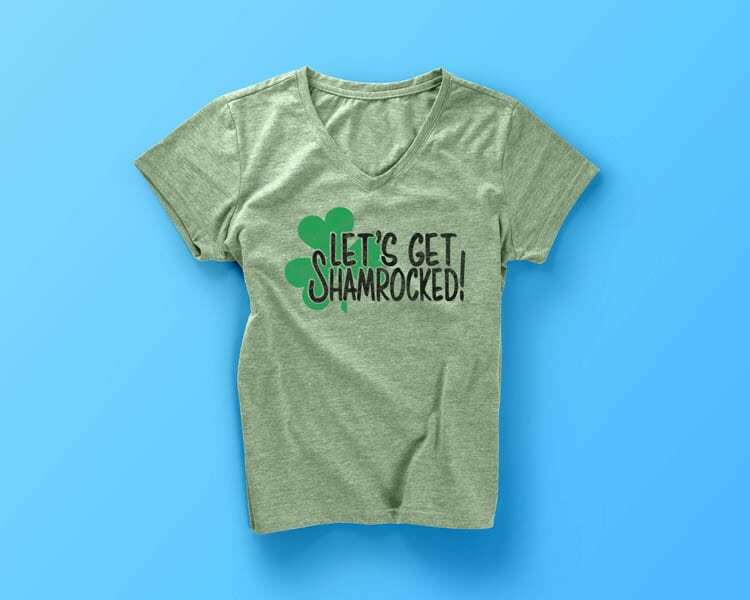 Make everyone a matching St. Patrick’s Day Shirt! Enter your name and email address to download the file. If you are an existing member, you may enter the freebie password. The download will begin instantly, please ensure you do not have pop-ups blocked in your browser. 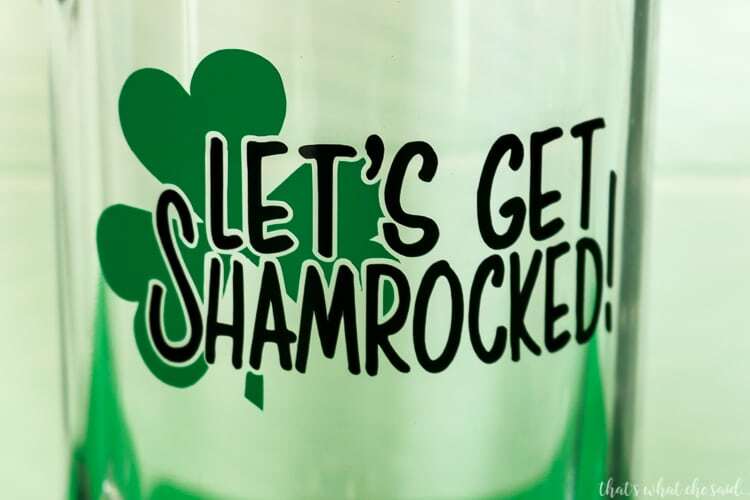 ALL of your Shamrock & St Pats items/posts are FanTabulous!!!!!! Thank You for sharing your Awesome creativity! :) Thanks Chelle! I appreciate it! Thanks so much, Patricia! Welcome!